We all know that the woot! gods have mysterious lives. Some people know tidbits about these mysterious beings; that Jason Toon has a sister that participated in American Idol, that Joel the Rejectorator is also Joel the Handsome Actor. But what else? Who is the elusive face behind the emotionless WootBot? And what of the others? Little is known about matthew, or lukeduff, or the many other woot! staff members. Your mission, should you choose to accept it, is to dig through the vast multitudes of information available on the Internet to provide either true or fantastical information about our dear woot! gods. Joel once participated in a wine.woot promotional video. Gatzby’s claim to fame was playing the ever-romantic Guybrush Threepwood in The Curse of Monkey Island 3. 50% what are you doing this weekend, 50% what the hell is Dave going on about? A former soccer (football) player, WineDavid joined the woot staff after deciding to put his grape crushing skills to better use. 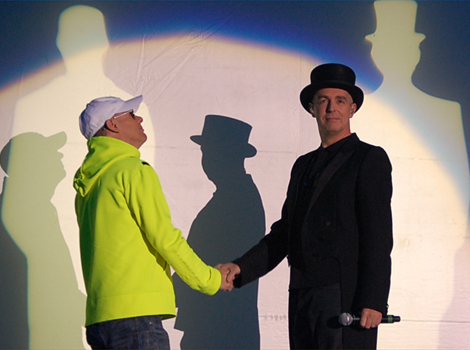 matthew, the unknown third Pet Shop Boy, was kicked out of the former trio for having a two dimensional personality. Jason Toon was of course, a member of The Red Squares, as was Matthew Shulz, and ultimately, Joel Lewis. Joel Lewis, Actor: Fatal Call. Joel Lewis is an actor, known for Fatal Call (2012), Ghost Image (2007) and Abdul Loves Cleopatra (2005). Oh yeah. Luke’s hot. Brother to Colin…can’t you see the resemblance? "Conservatives tolerant of centrists? That’s a good one. What about John McCain, Colin Powell, Rudy Giuliani, and other centrist Republicans who will never, EVER stand a chance of winning their party’s presidential primary, no matter how popular they may be among the general public? If the Constitution doesn’t keep Schwarzenegger from being elected president, the GOP’s own Mayberry ayatollahs will. No Democrat has ever been ruled out of the primaries for being “too moderate.” Hell, even Lieberman had a shot, if he hadn’t been such a blah candidate in every way. Indeed, the Democratic voters’ big problem is their obsessive quest for a centrist presidential candidate instead of a candidate whom they actually agree with. Hence Frankencandidates like Kerry and Dukakis, who are so “electable” nobody wants to actually elect them. Posted by Jason Toon at July 19, 2005 07:56 PM "
Jason Toon said it. John McCain will never, ever, stand a chance at his party’s primary. Little known fact - Gatsby is the “soldier” throwing the puppy off of the cliff.